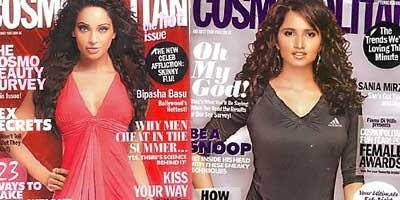 Latest issue of Cosmopolitan magazine has 2 beauties with cover honors: Sania Mirza and Bipasha Basu. Bipasha is seen in bright colored dress looking hot as always on the cover of HOT edition of mag. Sania Mirza feature on the cover of main magazine sporting her cool Adidas sporty dress and glitzy makeup. Checkout upclose look and grab the mag for more.